LETHBRIDGE - Day two of the 2017 Peewee Prospects Cup marked the end of round-robin play, with Capital Green, North Grey, Calgary White and South Black advancing to the semi-finals. In their lone games of the day, Pool B wrapped up with Calgary White clinching first place after a 5-2 win over Capital Orange. A 6-1 victory over North Blue gave South Black the same 1-1-1 record as Capital Orange, but South Black finished second in Pool B by virtue of a tie-breaker. Capital Green won both games against South Yellow and Calgary Red to as the lone undefeated team, landing in first place in Pool A. North Grey earned a berth in the semi-finals as well, winning both games against Calgary Red and South Yellow to finish second. Capital Green and South Black will battle in the first semi-final of the day at 1:00 p.m., with North Grey and Calgary White to follow at 3:30. Capital Orange and Calgary South play in the C final at 6:00 p.m., and the D final between North Blue and Calgary Red goes at 8:30 p.m.
From left: Doug Brown receives the Dave Ganley award from Dave Ganley, Mike Rebus receives his Officials Lifetime Member ring from Curtis Nichols, and Darren Kuz presents Darren Pickering with his North Central Zone Award. RED DEER – Hockey Alberta is proud to announce recipients of Officials Committee awards for 2017. The winners were revealed at the 2017 Officials Committee Annual General Meeting, which was held in Red Deer this past weekend. The Dave Ganley Award is presented to individuals who have made an outstanding contribution to Hockey Officiating in Alberta. Duane Moleni (right) works on his skating with Hockey Alberta Foundation Board Vice Chair Dennis Zukiwsky (left). RED DEER – While it’s a common sight every winter to see outdoor rinks across Canada full of youngsters learning to skate, you’ll also see the odd adult hitting the ice for the very first time. Although admittedly “late to the party”, Duane Moleni took the opportunity this past winter to embrace Canada’s pastime. Originally from New Zealand, he moved to Canada 11 years ago, but only decided to learn to skate this year. Moleni works with the Central Alberta Refugee Effort (C.A.R.E. ), which hosted the Learn to Skate in Red Deer, an initiative the Hockey Alberta Foundation partnered to help deliver. The Learn to Skate program ran Saturdays during the winter at an outdoor community rink, offering New Canadians of all skill levels a chance to play hockey, or learn the basics of the game. A former Rugby player, Moleni said the concept of hockey is something he’s still learning, even after living in Canada for more than ten years. After more than a decade of watching the sport, Moleni can pinpoint his love of the sport to one source – one of the hardest-hitting, toughest hockey players of all-time. Moleni’s determination and attitude caught the attention of many at the rink, especially the people who were helping him. "Duane is one of the big reasons why we had so much fun working with the C.A.R.E. 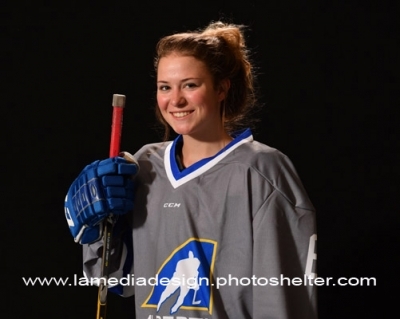 program this winter," said Tim Leer, the Hockey Albert Foundation’s Executive Director. "Although we were there as part of the Every Kid Every Community program, Duane proved that it’s never too late to learn how to play." With a full season on the ice now under his belt, Moleni said he’ll continue to work on his skating and skills, and without a doubt will be found out on the ice once again every Saturday this coming winter. 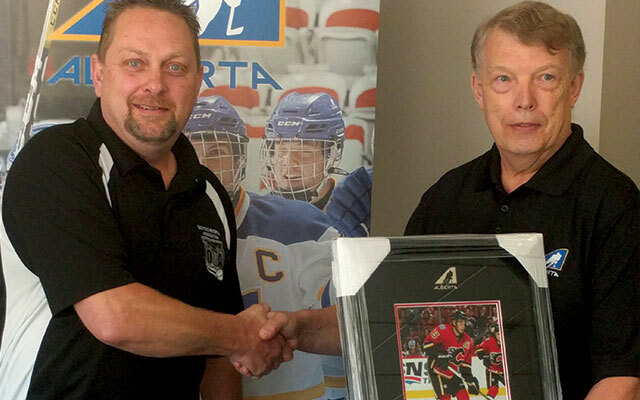 Hockey Alberta is proud to unveil a new section at hockeyalberta.ca. Home Ice Feature stories will focus on interesting stories about the individuals and groups who make a difference within the hockey community in Alberta. If you have a suggestion for a Home Ice Feature story, email info@hockeyalberta.ca. SPRUCE GROVE - The next step in the Team Alberta U18 Female selection process is underway, as 88 of the top 2000, 2001 and 2002-born female hockey players come together in Spruce Grove for the 2017 Spring Selection Camp. Players are invited to the camp based on previous Team Alberta programs, as well as scouting of players through their Midget club teams. The camp is a four-day test of fitness, skill and mental preparedness. The 2017 Spring Selection Camp runs through to Sunday at the Tri-Leisure Centre in Spruce Grove. From the Spring Selection Camp, 46 athletes are invited to attend the week-long Team Alberta Program U18 Provincial Summer Selection Camp in July. Players participate in high intensity on and off-ice training as well as classroom sessions and fitness testing. The 2017 Summer Selection Camp will be held July 11-16 in Camrose. After the provincial camp, a shortlist of players are identified to continue through a fall training camp and scouting process. The fall camp will include on and off-ice sessions, and some exhibition games. From there, the Team Alberta coaching staff announce the final 20-player roster. The 2017 National Women’s Under-18 Hockey Championship will be held November 1-5 in Quebec City. 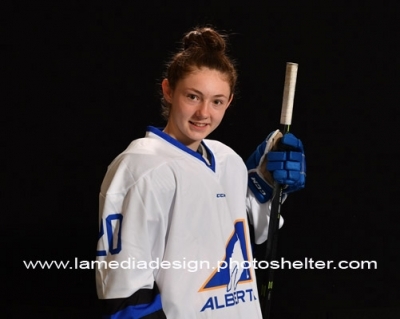 RED DEER - Eighty 2002-born males and 63 2002 and 2003-born females have been invited to take the next step with Hockey Alberta’s U16 programs. Invitations have been extended to the players to attend the Team Alberta U16 Female Summer Camp June 29 - July 2, and the Team Alberta U16 Male Summer Camp July 4-9 in Camrose. The male list includes eight goalies, 24 defence, and 48 forwards. The selection process is based on the Team Alberta scouting process throughout the 2016-17 season, as well as the 2017 Alberta Cup in Canmore in April. From the camp in Camrose, a shortlist will be established, with those players scouted with their club teams until the 20 players who will comprise the roster for Team Alberta are named in the fall. "We have a very talented group coming to Camrose for Summer Camp," said Mike Kraichy, Manager of Team Alberta. 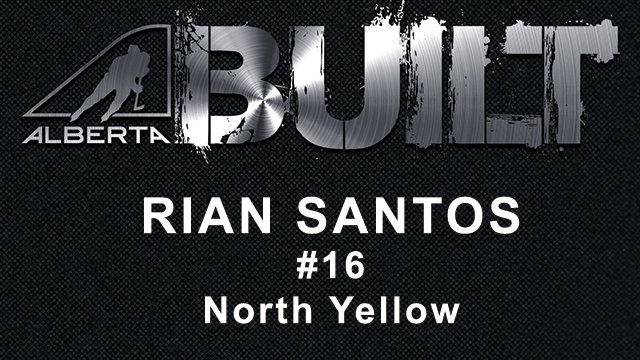 "We’re looking forward to seeing these players elevate their game for a chance to compete at the 2017 Western Canada U16 Challenge Cup." The female invitees include nine goalies, 18 defence, and 36 forwards. Players were scouted by Team Alberta staff at the 2017 Alberta Challenge in Olds in May. This group of athletes is eligible to compete at the 2019 Canada Winter Games in Red Deer as part of the Team Alberta U18 Female squad. 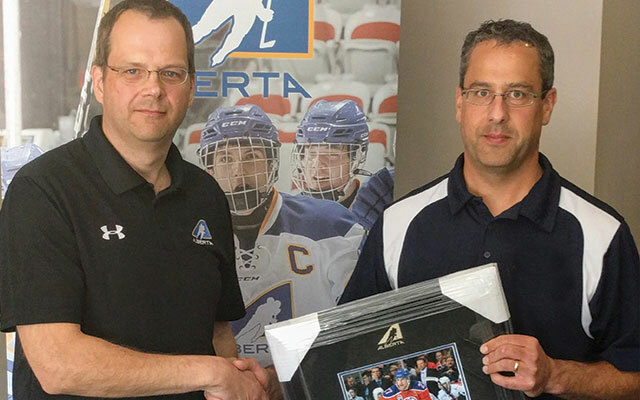 "We’re very happy with the list of players we’ve invited to our U16 Summer Camp this year," said Mathieu Provencher, Coordinator of Team Alberta Female. "These athletes are the future of our U18 program, and have a chance to make a good impression as we move towards the 2019 Canada Winter Games." LETHBRIDGE - The hockey stories were plentiful as Jason Strudwick, Jamie McLennan, and Rob Brown spoke at the Every Kid Every Community Speaker Series in Lethbridge on May 13. The three former NHL players had their broadcasting chops on display, entertaining the crowd with stories from their past. Rob Kerr from Sportsnet 960 in Calgary served as the event’s Master of Ceremonies. The event was hosted by the Hockey Alberta Foundation, in partnership with the Lethbridge Minor Hockey Association, and ran in conjunction with the 2017 Peewee Prospects Cup. All funds raised will go towards the Foundation’s Every Kid Every Community program, as well as Lethbridge Minor Hockey community initiatives. "The Every Kid Every Community Speaker Series in Lethbridge was a success, raising both funds and awareness for the EKEC program," said Tim Leer, Executive Director of the Hockey Alberta Foundation. "We are extremely grateful to everyone who attended, our sponsors, Lethbridge Minor Hockey, and of course Jason Strudwick, Jamie McLennan, and Rob Brown for their support." The Hockey Alberta Foundation would like to thank its presenting sponsor, ATB Investor Services, as well as ATB Financial, Cavendish Farms, and Melcor. The Every Kid Every Community program was launched in 2011, with the goal of ensuring a gateway to play hockey for any child in Alberta who is interested in the sport. The goal is to provide every child in Alberta the opportunity to play hockey, have fun and, in many cases, experience the sport for the first time. Funding through Every Kid Every Community is available to assist amateur sports organizations, minor hockey organizations, youth groups, recreation groups, or any community group with an idea, project or program that helps establish an event or program to get local children active in hockey. Hockey is a great way for kids to be active, healthy and surrounded by positive leaders in their community. Keeping kids active in sport helps reduce childhood obesity, creates a safe and fun environment and forms friendships. RED DEER - As part of its three-year strategic planning process, Hockey Alberta is developing a new Parent Engagement Program (PEP) strategy. A key component the PEP strategy are the Respect in Sport Parent and Activity Leader/Coach programs. Hockey Alberta has required successful completion of those programs since partnering with Respect Group in 2012. Effective for the 2018-19 season, Hockey Alberta will require re-certification every four seasons for the RIS Parent and Activity Leader/Coach online programs. This will be mandatory for all families with players in sanctioned minor hockey and team officials. A minimum of one parent/caregiver per household must complete the Parent program. As well, Speak Out certification will no longer be recognized; those with Speak Out will require the appropriate Respect in Sport program. An FAQ sheet has been developed to answer some questions. Over the course of the 2017-18 season, full details will be provided, including a renewal schedule and information about the PEP strategy. For questions, please contact Mike Klass, Senior Manager, Business Operations at mklass@hockeyalberta.ca or 403-342-6777. LETHBRIDGE – After a slow start to the tournament, South Black defeated North Grey 4-1 to capture the 2017 Peewee Prospects Cup. South Black and North Grey both lost their first games of the week, but both rebounded to finish second in their respective pools, and won their semi-final games to earn a berth in the championship final. It’s an extra-special victory for South Black Captain Liam Watkins and teammate Gavin Schmidt, as their older brothers Lucas and Hayden won the Alberta Cup with Team South just two weeks prior. 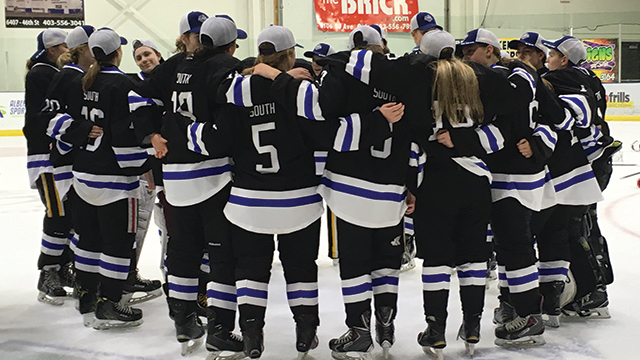 South Black’s win also marked a clean sweep for South teams this year, with South winning the Alberta Cup, and South Black winning the Alberta Challenge. Prior to the Championship game, the 2015 Peewee Prospects Cup Champions, Capital Green claimed third place with a 5-1 win over Calgary White. The next Peewee Prospects Cup will be held in 2019. LETHBRIDGE - With semi-final Saturday in the books, North Grey and South Black will go head-to-head for the Peewee Prospect’s Cup. South Black won the first semi-final game of the day over Capital Green 6-2, and North Grey defeated Calgary White 7-3. Capital Green and Calgary White play in the bronze medal game at 8:30 a.m. Sunday, while South Black and North Grey battle for the title at 11. Meanwhile, South Yellow took the C Final with a 5-4 overtime win over Capital Orange, and North Blue won the D Final against Calgary Red 9-1. CALGARY - Six Albertans were on the list as Hockey Canada announced it’s 28-player Olympic Centralized roster on Thursday. 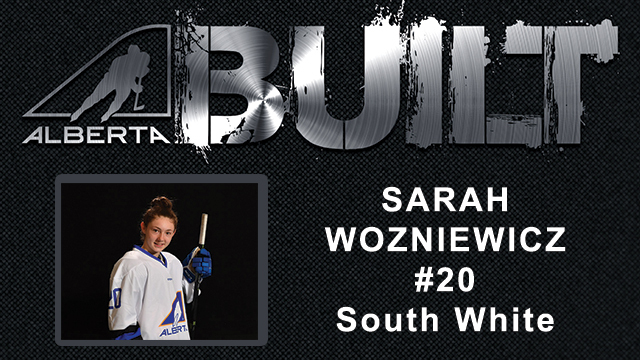 Goaltender Shannon Szabados (Edmonton) and Defender Meaghan Mikkelson (St. Albert) were both selected as players. Melody Davidson, James Emery (Calgary), Brad Kirkwood (Calgary), and Christine Atkins (Fort Mcleod) are all a part of the team staff. Szabados, Mikkelson, and 26 other players will be centralized in Calgary throughout the 2017-18 season in preparation for the 2018 Olympic Winter Games in PyeongChang, South Korea. Emerance Maschmeyer (Bruderheim) is one of two alternate goaltenders who will be available to support the centralization roster throughout the 2017-18 season but will remain with their club teams. LETHBRIDGE - After the first six games of the 2017 Peewee Prospects Cup, six of eight teams came away with points. Capital Orange sits atop Pool B after winning its first game of the day against North Blue 6-2, and tied 5-5 against South Black, who lost the first game of the day 5-2 to Calgary White. North Blue edged Calgary White 4-3, giving all four teams in Pool B at least one point. Meanwhile, in Pool A, Capital Green and South Yellow won their lone games of the day, defeating North Grey 2-1 and Calgary South 6-4, respectively. Day two of the Peewee Prospects Cup kicks off at 8:30 a.m. with a battle between North Grey and Calgary South. LETHBRIDGE - Southern Alberta is set to host 160 of the top 2004-born male hockey players in Alberta, as the 2017 Peewee Prospects Cup gets underway in Lethbridge. Eight teams will go head-to-head at the Nicolas Sheran Arena from Thursday to Sunday. The teams include Calgary Red, Calgary White, Capital Green, Capital Orange, South Black, South Yellow, North Grey, and North Blue. The teams will play in a four-day, tournament-format competition.Team rosters can be found here, and full tournament results will be displayed here. You can also follow along with the action on Twitter. The Hockey Alberta Peewee Prospects Cup program is the start of the Hockey Alberta Development program and is held in alternate years with the Alberta Winter Games. The event provides second-year peewee athletes, along with coaches, trainers and administrators, an opportunity to discover the qualities of competitive hockey in a well-organized regional camp and select team competition. Male 2004-born athletes are eligible for the 2017 Peewee Prospects Cup. The Peewee Prospects Cup begins with four regional camps designed to allow athletes, coaches and trainers to show their skills and receive top-level instruction and evaluation. The top 40 athletes from each regional camp (two teams from each camp), four coaches, two coach mentors and two directors of operations are selected to participate in the competition. OLDS - South Black went wire-to-wire as the tournament’s top team to win the 2017 Alberta Challenge. South Black went undefeated (4-0-1) through the tournament, and clinched the Alberta Challenge with a 1-0 win over South White. 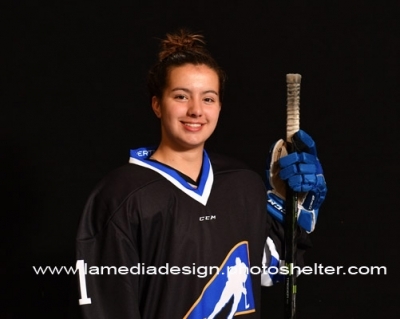 This is a special win for South Black’s DOP Val Alexander, who’s daughter Cylenna won the last Alberta Challenge as DOP with the North Predators in 2015. Alexander was also in competition with daughter Channia this weekend, who served as DOP for the North Grey team. South Green claimed bronze earlier in the day. A couple of second period goals saw them defeat the third place ranked South Yellow by a score of 2-1. Earlier in the day North Blue defeated North Grey by a score of 3-1 to claim fifth place in the tournment. 2017 is the first year the Alberta Challenge has been held in Olds. The next Alberta Challenge will take place in 2019. 1 - Good person - Know who you are. 2 - Character player - Believe in yourself. OLDS - While many players at the Alberta Challenge and Alberta Cup are following in the footsteps of their older siblings, it’s not often two can share the experience at the same time. Twins Ali and A.J. Macaulay have the rare opportunity to watch eachother compete against the best in the province. Ali is currently competing with North Yellow at the Alberta Challenge, while A.J. skated with Northeast just a week prior at the Alberta Cup. The two spoke about their sibling rivalry, and how they’ve leaned on eachother throughout the experience. For more scores, stats and stories from the 2017 Alberta Cup, click here. OLDS - Hockey Alberta is pleased to announce the 2017 Alberta Challenge All-Stars. The tournament All-Stars were announced Saturday night at the Alberta Challenge banquet at the Pomeroy Inn & Suites. All-Stars were voted Scouts and Team Alberta staff. OLDS - The final match-ups are set. 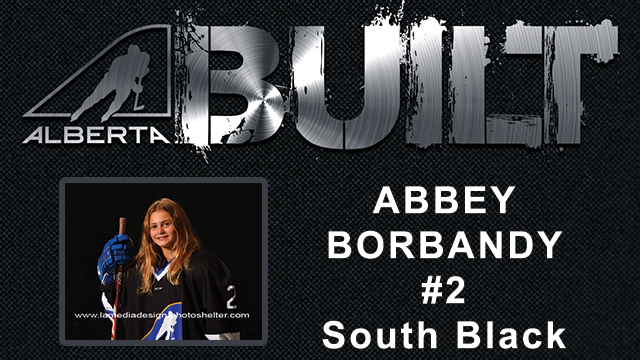 South Black and South White will go head-to-head in the 2017 Alberta Challenge final on Sunday. South Black emerged the front runner following round-robin play, finishing three days of competition with three wins and one tie. Tiebreaker determined South Black’s competition in the final would be South White. North Yellow and South Green will play in Sunday’s Bronze game. North Yellow, finishing round-robin play with two wins, South Green finishing with one win. North Blue and North Grey will play the first game of Sunday, for fifth place, each finishing with one win. The final day of competition begins tomorrow, May 7, at 9:30 am. OLDS - The Alberta Challenge is not only a great opportunity for players to develop, but trainers as well. Every year, a Mentor Trainer is in place at the competition to oversee each Team Trainer, and help guide them through the process. This year’s Mentor Trainer, Dave Campbell, discusses the importance of the Trainer program and how it’s helped him grow as a Trainer. For more scores, stats and stories from the 2017 Alberta Challenge, click here. OLDS - After another busy day of hockey at the 2017 Alberta Challenge, round robin play continued with each team competing in two games during the day. After completing three games each, South Black and North Yellow are both 2-0-1 and, with five points a piece, and finish day two on top of team standings. South Green finished the day with one win and one tie while South White finished the day with one loss and one tie. These results, combined with yesterday’s stats, these teams are now both tied for second place with three points each. North Blue and North Grey squared off in the final game of the day with North Blue winning by a score of 3-0, climbing within one point of the teams tied for second place. Saturday kicks off with South White and North Yellow playing at 10:00 am, followed by North Grey and South Green facing off at 12:15 pm. The final game of round robin play will commence at 2:30 pm between South Black and North Blue. Team Alberta U18 Head Coach Craig Perrett, who is also serving as a Coach Mentor at the 2017 Alberta Challenge, will be just the third coach to serve on both the male and female sides of the Team Alberta program. OLDS - While many coaches have had the opportunity to be a part of the Team Alberta program over the years, 2017 Team Alberta U18 Female Head Coach Craig Perrett will be just the third to do so on both the male and female side. 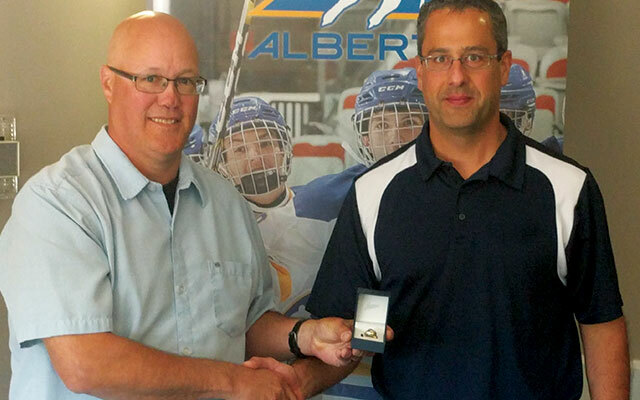 Perrett, who is also serving as a Mentor at the 2017 Alberta Challenge, was an Assistant Coach with Team Alberta’s gold medal winning U16 Male team in 2015, and has spent many years with the Team Alberta program in various roles, most recently serving as a Coach Mentor at the Alberta Cup and Alberta Winter Games. Now, as he makes the transition from the male side to the female side of the program, Perrett has already noticed the differences and similarities between the two, and says he’s looking forward to the new challenge. OLDS - After a busy first day of the 2017 Alberta Challenge in Olds, three of six teams came away with points. South Black, South White and North Yellow all earned two points from the first day of round-robin play, while South Green, North Blue and North Grey will seek redemption Friday. All teams will play two games on day two. Round-robin play will continue Saturday morning with finals commencing on Sunday May 7th. Former Team Alberta player Channia Alexander (right) and her mom, Val, will be going head-to-head this weekend as Directors of Operations at the 2017 Alberta Challenge. OLDS - Although Val Alexander’s team will be competing against her daughter Channia’s team at the 2017 Alberta Challenge, the mother-daughter duo are enjoying the experience together. It’s Val’s third Alberta Challenge as a Director of Operations, this year with South Black, while Channia, the Director of Operations for North Grey, is volunteering with the Challenge for the first time. 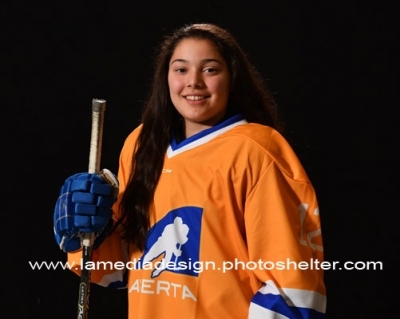 Channia played in Team Alberta’s U18 Female program from 2012-15, winning a bronze medal with Team Alberta at the 2015 Canada Winter Games. 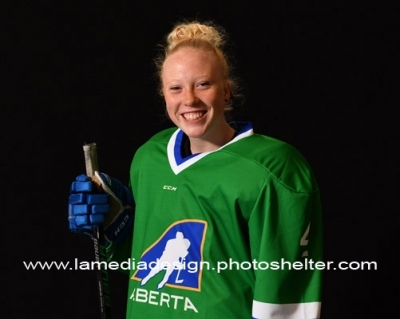 Both Channia and Val are excited to give back to the Team Alberta program, and provide the same experience they both received while Channia was coming up through the program. For the third straight year, an Albertan has been selected first overall at the 2017 Western Hockey League Bantam Draft. In total, 74 players from Alberta were drafted, one more than in 2016. 2017 Alberta Cup All-Star Kaiden Guhle (Sherwood Park) was the top pick in the draft, going to the Prince Albert Raiders. 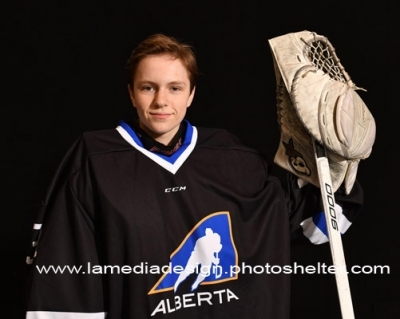 Connor McLennan (Wainwright) was selected right after by the Kootenay Ice, giving Alberta yet another 1-2 punch at the draft.Another Alberta Cup All-Star, Garin Bjorklund (Calgary), was the first goaltender taken in the draft, going 21st overall to the Medicine Hat Tigers. Seven Albertans went in the top 10 picks, and 11 player were selected in the first round, the most of the four Western provinces. Fourty of the players drafted are forwards, 25 are defence, and nine are goaltenders. A recap of the 2017 WHL Bantam Draft can be found by clicking here. RED DEER - The Hockey Alberta Foundation is proud to recognize Lethbridge Minor Hockey Association as its TEAMMATE of the month for May. The Lethbridge Minor Hockey Association, along with the Hockey Alberta Foundation will be hosting an Every Kid Every Community speaker series in Lethbridge on May 13, in conjunction with the Peewee Prospects Cup. The funds raised from this event will support the EKEC grant program and Lethbridge Minor Hockey initiatives. "Lethbridge Minor Hockey is happy to support the Hockey Alberta Foundation, because it fits perfectly with our mandate of ’good citizen, good player", as we’re always trying to develop future leaders in our community," said Keith Hitchcock, General Manager of Lethbridge Minor Hockey. 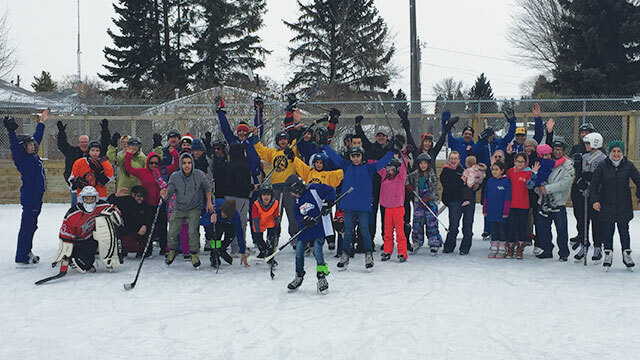 "The Every Kid Every Community program allows us to launch new streams of programs that otherwise would not get off the ground without funding from the Hockey Alberta Foundation." A long time supporter of the Hockey Alberta Foundation, the Hockey Alberta Foundation would like to thank the Lethbridge Minor Hockey Association for all they do for kids in and around Lethbridge, and the great partner they’ve been over the years in growing the game. We are proud to have on our team. Tickets for the EKEC Speaker Series in Lethbridge are still on sale. Tickets are $65 each, or $475 for a table of 8. For more details and ticket information, click here.